Birds of a feather flock together. We’re all in the same boat. Great minds think alike. We have a number of phrases and sayings that speak to the significance of peer influence. Bruce Cleland and his wife, Izzi, found out their 2-year-old daughter had leukemia. The survival rate was 55%. Bruce immersed himself into the world of blood cancer treatments, which led to a deep involvement with the Leukemia & Lymphoma Society. Two years later, Bruce’s daughter was in remission. To honor his daughter and show his appreciation to the Leukemia & Lymphoma Society he rallied 38 people to run the New York City Marathon to raise money. With a few corporate sponsors (but mostly through individual donations), Bruce was able to raise $322,000. That was only after spending 5 months training and preparing. The group gathered regularly at a local restaurant or bar to compare notes and talk about their progress. Everybody was committed to the group and the cause. Because of that mutual support the group succeeded. That 38-member team was just a start. That was the beginning of a successful endurance-sport fundraising program which came to be Team In Training, inspiring over 650,000 participants to achieve their goals and raise $1.3 billion for blood cancer research. That survival rate of 55% is 95% today! Our folks knew the power of peer influence. That’s why they always wanted to know who we’d be with when we left the house. It’s why they wanted to know our friends. In 2005 Gary Ladd, a professor of psychology and human development at Arizona State University, published a book, “Children’s Peer Relations And Social Competence: A Century Of Progress.” Peer relations are more balanced than parent-child relations. As children we’re largely influenced by these relationships. Considerable research has proven that our level of self-confidence and self-efficacy is largely determined by peer influence. As we interact with our peers we learn things about others and ourselves that serve us with greater confidence. Our peers also hold us accountable. Teachers threaten to punish the entire class if one class clown continues to disrupt the class. They do it because it works. We would all sit there thinking how unfair that would be, but the pressure on the evil doer to be held accountable to the entire class changed the dynamic of their behavior. Hopefully. Peer influence drives learning. Lecturing is giving way to facilitating where students are more engaged. Students engage as colleagues not competitors. There are many benefits to collaboration and a sense of abundance. Students learn the value of dialogue. Dialogue trumps debate or discussion, providing students with richer and more meaningful conversations. Students learn to trust one another. Sharing and listening without fear of being judged builds trust. That allows for deeper, more honest conversations. Students get a taste of what abundance looks like. Students know that no matter how much they contribute to the group, they’ll always get more in return – and as they do, the group grows stronger. Peer influence happens in the workplace, too. The Handbook Of Interpersonal Communication (by Knapp and Daley) defines peer relationships as “relationships between co-workers at the same hierarchical level with no formal authority over one another.” Peers serve as important sources of intellectual and emotional support. The boss says something in a meeting, then the employees begin to talk about it. According to the book Seeing Red Cars by Laura Goodrich, they’re trying to make sense of it, but too frequently it results in people making assumptions and engaging in banter that doesn’t have much to do with taking action. Author Ken Blanchard notes that up to 70% of all organizational initiatives fail. Leaders can’t impose their will, but they can create conditions that allow employees to make the organization successful and achieve those strategic goals more often. Edelman Trust Barometer has tracked public trust in institutions for the past 15 years. In 2015 the barometer showed a decline in trust levels across the board. When we don’t trust our institutions, or government – we turn to each other. To our peers. On a zero to ten scale, how likely is it that you would recommend us (or this produce/service/brand) to a friend or colleague? The real power is found in our willingness to listen to our peers. This influence isn’t always conscious. Are you a Mac person or a PC person? It’s more than technology. It’s community and you likely relate to one or the other. And if you relate to one, then you don’t relate to the other. At least not as much. A study of buskers in a New York City subway showed that when people saw others giving money to the busker, they were eight times more likely to contribute than those who didn’t see other people contributing. As a lifelong retailer I can attest to the power of peers during a storewide sale. When shoppers see others pressing around the cashier counter making purchases they’re positively influenced to make a purchase themselves. We have a yearning to be part of a community. Peer influence impacts that, even if we’re not consciously thinking about it. And it crosses all cultures. The degree and how its manifested can differ from country to country, society to society – but the concepts and foundation are the same anywhere you go. The power of peers is word of mouth at scale. We’re less inclined to trust institutional experts than the opinions and experiences of peers we’ve never met. We jump on Twitter and Yelp and listen to what others have to say. So powerful is this influence that in 2006 Time magazine name “YOU” as the person of the year. 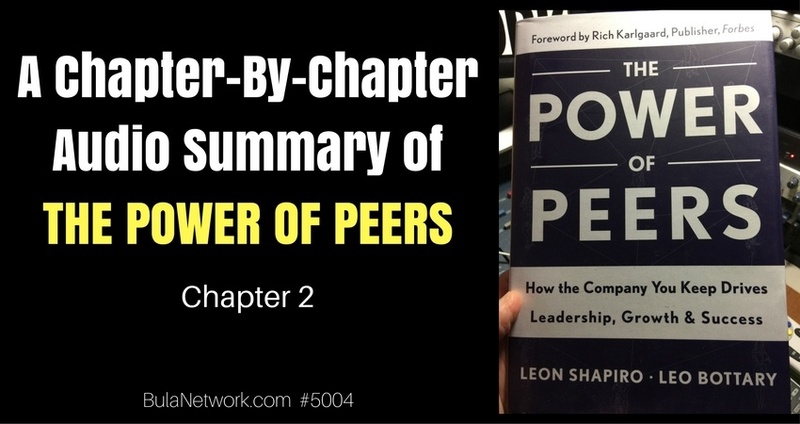 Amazon, Linkedin, GlassDoor and many other online communities leverage the power of peers. We find ourselves collaborating through these communities. Even as members come and go, the communities remain strong. Peer influence impacts winning. One of the most extraordinary examples of this is the women’s basketball team at the University of Connecticut. In 2015 the team won their 10th national title in 20 years. What makes them so dominant? Their head coach, Geno Auriemma, suggests it’s culture and having highly competitive players who are committed to each other. Players see other high-level players making sacrifices for the team. It influences all members of the team to put the team ahead of their own personal goals. Having the support of a team is powerful no matter if you’re running your first marathon to raise money for a cause or if you’re part of a national title team of basketball players. At home, in school, at work or in sports – peers matter. Sometimes their influence is right up front, easily seen. Other times, it’s subtle and we don’t even recognize it. Peer influence doesn’t care if you’re the CEO or business owner because no matter where people work, or go to school, peer influence happens in person and online. Your peers are critical to your success and happiness. They include everybody from those colleagues you see every day to perfect strangers who share a common interest (even if it’s just for a moment in time). I hope you’re beginning to more clearly see the power of peers. Mostly, I hope you’re beginning to see how powerful it can be to help you grow your business and your life. I’m working to help improve the business and lives of just 14 business owners to join me as I facilitate the charter groups of THE PEER ADVANTAGE.